Sadly, no child is too young to have high blood pressure. In fact, an estimated 3.5 percent of children and adolescents in the U.S. have hypertension, or abnormally high blood pressure—and experts say that number is likely much higher. To address these concerns (and catch the condition much earlier! ), the American Academy of Pediatrics recently updated the guidelines for identifying high blood pressure in children and teens. Twenty experts worked on the committee to develop the report, reviewing about 15,000 scientific articles and studies published since 2004. 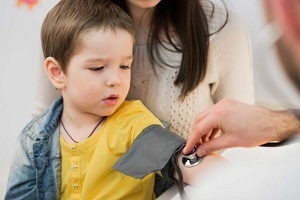 As a result, the new blood pressure values are lower than they were before, meaning more children are likely to be diagnosed with hypertension. But that’s not necessarily a bad thing; doctors can now catch cases of hypertension that would have previously gone untreated. Untreated high blood pressure could take a serious toll on the body, including damage to the heart, kidneys, and brain. To catch the signs of hypertension early, pediatricians must perform routine blood pressure checks at annual doctor’s visits, according to AAP’s guidelines. And a child diagnosed with hypertension should adopt certain lifestyle changes, such as decreasing their consumption of foods that worsen high blood pressure and increasing foods that can lower hypertension. Exercise can also combat obesity and high blood pressure, the report says. If that fails to work, or the child has another condition like diabetes or kidney disease, blood pressure-lowering medications might be necessary. Thanks to these guidelines, parents and doctors can now work together to identify high blood pressure in their children. Don’t miss the things your doctor might not tell you about healthy blood pressure, either.